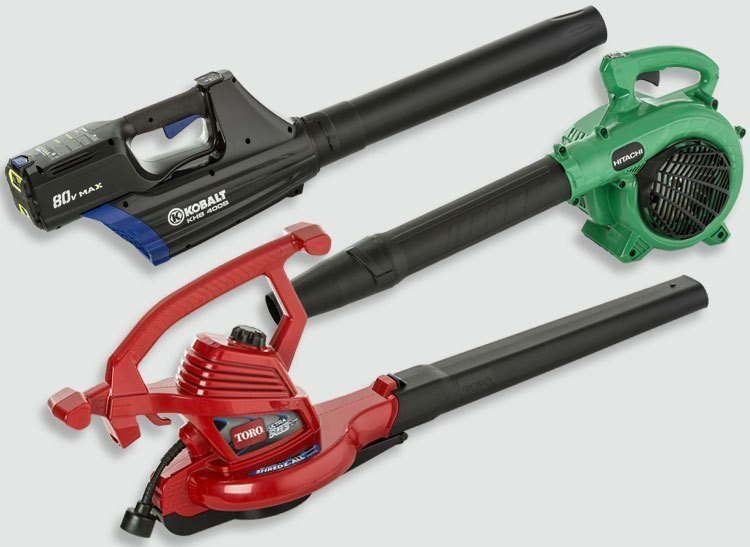 There’s no better feeling than picking up a leaf blower and watching the dirt and debris disappear from your garden or driveway as if by magic. 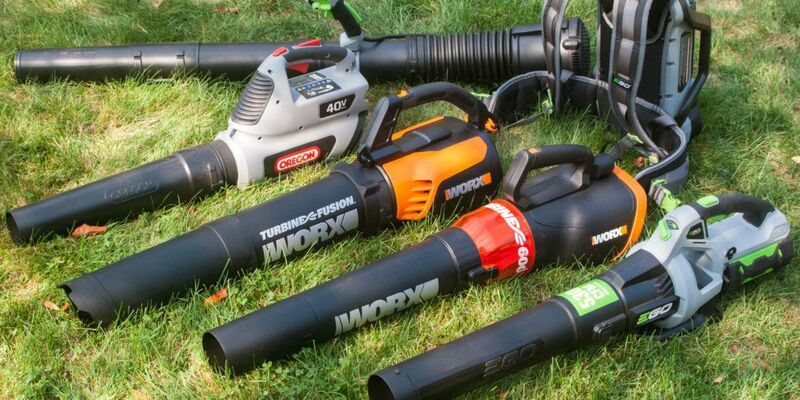 Choosing which leaf blower to buy can be tricky. 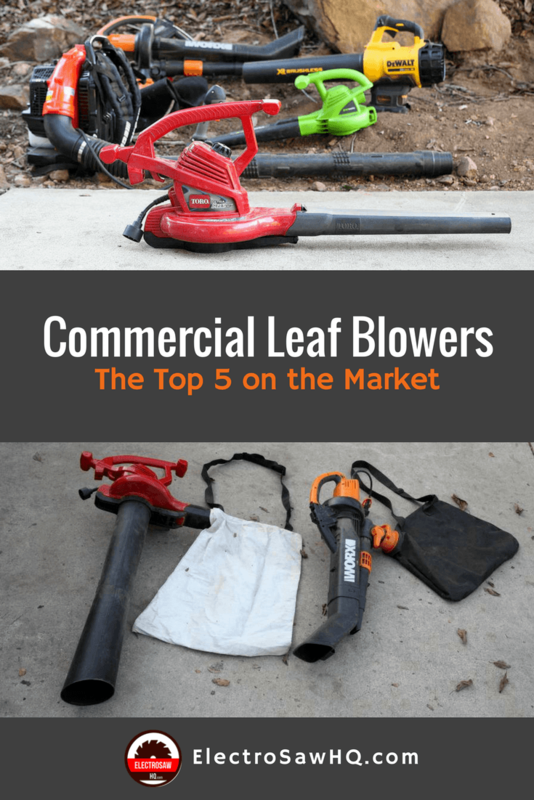 Here are my suggestions for finding the best commercial leaf blower to suit your needs. These are perfect for anyone who just wants to make their sweeping duties a little easier. They are usually the quietest and the lightest and make light work of leaves and pine needles from patios, wooden awnings or driveways. Some of the light duty blowers come with a vacuum and/or mulching function, which makes them great for small all-round garden work. These are best suited to those looking to clear up lawn areas. Whilst a few options exist, the best all-round option here are usually the corded electric blowers, when used in conjunction with a long extension lead. This provides you a fantastic combination of power and versatility from a machine that’s not going to annoy the neighbours. The corded option is recommended over the battery-powered option as its runtime is better and doesn’t need to be recharged. The benefits of battery power are better saved for jobs that require them. For medium-sized properties, up to roughly half an acre, it might be best to consider a handheld gas powered blower. These are traditionally both heavier and louder than electric blowers, and require more maintenance on the working parts that allow the motor to start and function. However, they can go anywhere and run all day, making them perfect for a medium-sized property that you’re looking to service in one go. As such, these machines should only be purchased when the added power and convenience is required. Always try and purchase an engine size of between 24 and 33 cc, as this will give you the added power expected. 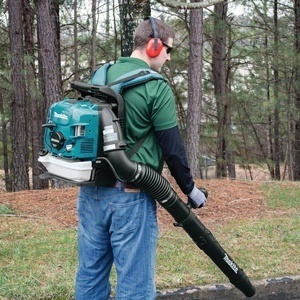 The most powerful in the commercial leaf blower market is the backpack gas leaf blower. They are for heavy-duty work and are worn on your back, due to their increased size. For really big yards and industrial use, the backpack blowers are your best bet. When looking into backpack options, aim for an engine of 40cc or higher and try and pick up a hybrid or 4-cycle engine if possible, as these will offer the least noise and fume pollution. Other handy extras to look out for are models with additional padding (as the machine gets very uncomfortable given its size) and, if possible, vibration reduction. When comparing the strength of your leaf blowers, the most important measurements will be mph (miles per hour) and cfm (cubic feet per meter). These indicate the power that the air is expelled from the blower, with the MPH indicating the maximum air speed reached and the CFM providing an indication of the volume of air expelled per minute. Whilst both are important as they work hand in hand, cfm can be said to give the most accurate indication of the strength of a leaf blower’s motor. Noise is another important factor to consider (measured in dB). This is particularly important for people living in close proximity to their neighbours or in security complexes, as bylaws make dictate what blower you are able to buy, due to noise and air pollution. Weight is another important factor and it’s important to be honest about your upper body strength and the size you’re going to be comfortable using on a regular basis. Finally, try and opt for blowers with variable speed settings, as these offer the greatest level of control. The Hitachi RB23EAP is a powerhouse in a tiny package. Weighing in at 8.6lbs, the RB23EAP produces 441 cfm of airflow and has a max speed of 170 mph. The machine is brilliantly weighted and, combined with its ergonomic design, is nimble and flexible for tighter to reach spaces. Starting the Hitachi RB23EAP is easy, even for those who are unfamiliar with pull start blowers. It even comes with a purge primer, which is a small bubble near the speed trigger which you press to remove air from the gas line. The large button is intuitive and easy to use, although it would have been nice if Hitachi had included a locking mechanism. 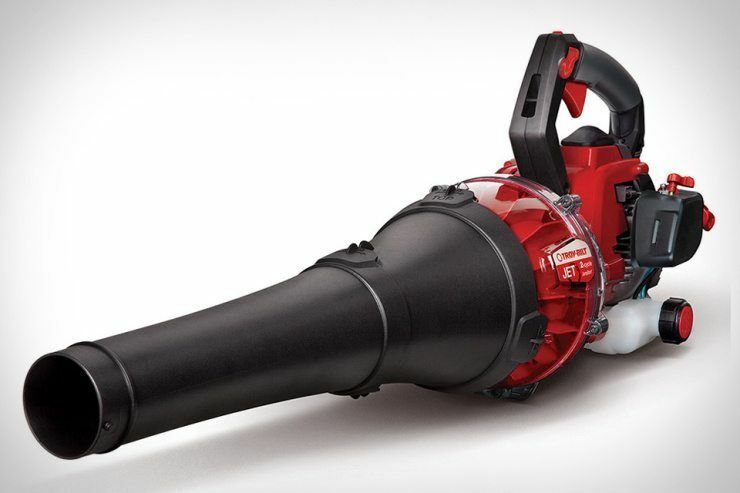 The ace in the hole with the Hitachi RB23EAP is the warranty: it comes with a 7-year warranty for home use, 2 years business use and 1 year for leasing; which is the best out of any of the blowers I’ve seen on the market. 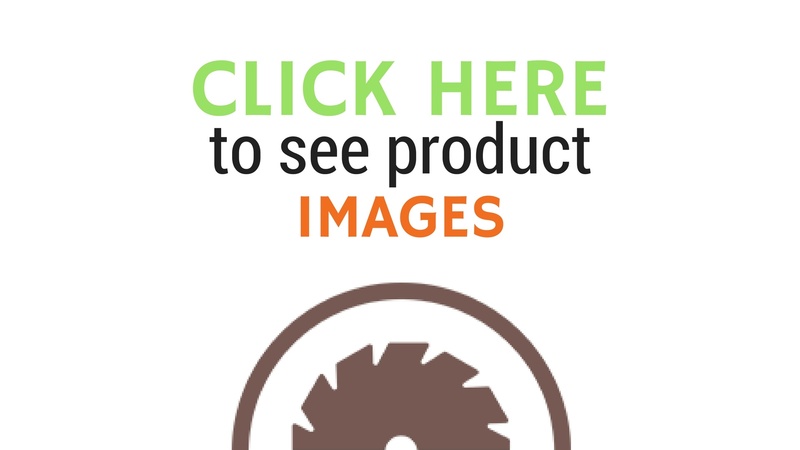 The Husqvarna 952711925 is an extremely versatile machine at an extremely attractive price point considering the brand name and quality of the tool. Its 28cc 1.1 hp, 2-cylinder engine reaches a full 8000 rpm, allowing it to achieve 470 cfm and a max speed of 170 mph with the flat tube (and 130 mph when the round tube is installed). The Husqvarna is also both EPA and CARB compliant, meaning that the emissions are lower than some older gas powered blowers, which is better for your health and the health of the planet. The Husqvarna is a breeze to start and I found myself doing so repeatedly with just one pull. This is thanks to air purge system, which removes air from the tank so that you don’t have to. Like all good handheld blowers, the variable speed trigger is located on the handle. The Makita BHX2500CA is a fantastic machine with some really noteworthy features as standard. The Makita makes use of a four-stroke engine, meaning that you don’t need to mix oil and gas before using. The four-cylinder engine has another very important benefit: it’s quieter. Its noise level has been measured at 67 dB, which is remarkably quiet and will be perfect for people with neighbours close by. The four-cylinder engine has slightly lower output than some other machines in this bracket, with the Makita giving 356 cfm and a max speed of 145 mph. The engine is very easy to start, thanks to an automatic mechanical decompression. It also comes with a slightly larger gas tank (17.6 oz), which make it great for people who aren’t able to refuel as easily. The machine is very comfortable, thanks to its ergonomic handle and cruise control options. The machine also comes with an adjustable nozzle (which can be extended) and a toolkit for quick changes. The machine comes with a one-year warranty and 30-day money back guarantee. The Husqvarna 150BT is a very powerful backpack blower, but is surprisingly easy to live with. It has decreased levels of vibration, which after wearing the harness for a while you’ll be very grateful for. The harness itself is ergonomic and comfortable and makes it simple to transport the machine around, in spite of its 22.5lb frame. The performance of the machine is excellent, offering 692 cfm and a max airspeed of 251 mph when a flat nozzle is being used and 214.75 mph with the round nozzle that comes standard. Perfect for use on larger properties with lots of leaves and debris, the Husqvarna will deal easily with almost anything you can throw at it, again and again. It comes standard with a 2-year consumer warranty, for added peace of mind. The Makita EB7650WH MM4 also makes use of a 4-cylinder engine, like the handheld option reviewed above. This means that it doesn’t require a mix of oil and gas, which is extremely convenient. It also means that the machine is able to function at a much lower noise level, which is again very handy for people with sensitive neighbours. 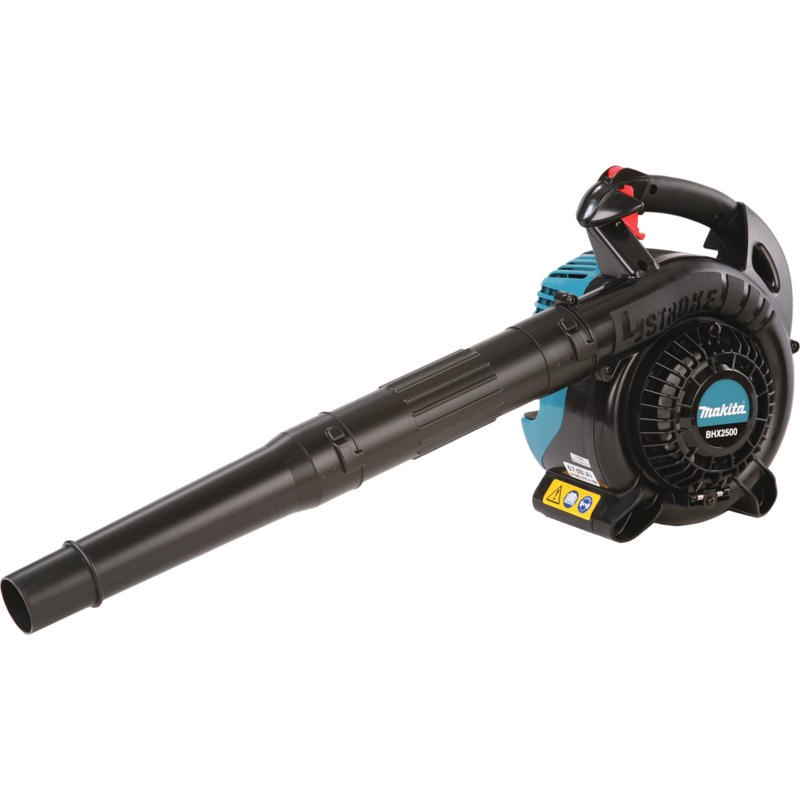 Unfortunately, the same constraints of a four cylinder engine apply, meaning that the output of the EB7650WH MM4 is 526 cfm and a max speed of 195 mph, which is somewhat lower than most backpack blowers. Whilst still powerful enough to accomplish most of the jobs required from it, it is competing from a power perspective with hand held blowers rather than backpack options. The design of the EB7650WH MM4 is excellent, as we’ve come to expect from Makita. The harness is ergonomic and moulds itself to the contours of your back for increased comfort. The variable speed trigger is intuitive and large and comes with a cruise control option, allowing for you to set the machine up and clear a large space without too much forethought. It comes standard with a one year warranty and 90-day money back guarantee. Extremely quiet for a backpack blower (only 76dBA). 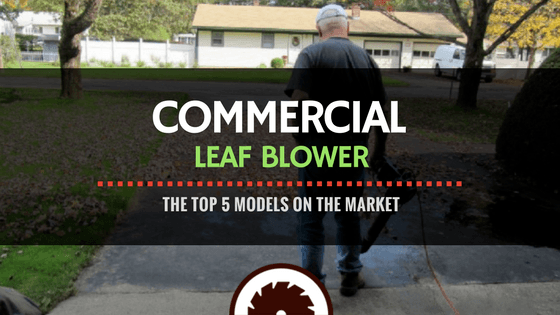 It is extremely difficult to pick just one commercial leaf blower, given the vast differences between the various models, all of which have their place in different environments. However, the clear winner for my purposes was the Hitachi RB24EAP. It gives you amazing value for money when you consider the strength of the engine. It’s lightweight body is comfortable to use and can be picked up by experienced blowers and novices alike without too much fuss. The craftsmanship and balance of the machine is excellent and is what I’ve come to expect from Hitachi. The purge primer is a fantastic addition and makes the Hitachi one of the best machines from a longevity perspective, which is backed up by the staggering 7-year warranty on each of these machines.